Topics: Adaptors, Strings, Electric, Acoustic, Classical, and Bass. 28 users visit the site each day, each viewing 1.50 pages. It has 2 DNS records, ns1.storminternet.co.uk, and ns2.storminternet.co.uk. It is hosted by Dh-sr-nix (England, Leeds,) using Apache/1 web server. 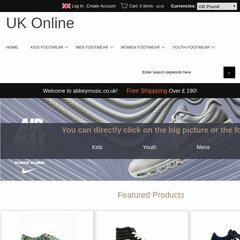 Abbeymusic.co.uk's server IP number is 81.21.75.32.